If you’re been wedding planning for yourself or assisted in any weddings lately, you probably know that they can cost a pretty penny. In fact, the average American wedding cost $35,329 in 2016. If that’s shocking to you, you’re not the only one. That fact surprised me too. Of the many ways to cut back on wedding costs, finding a budget-friendly wedding dress is one of the easiest. That’s because wedding dresses are available for every budget from as low as $99 to over $10k. But as a bride, you don’t want just any dress. Most brides want to look and feel their best on their wedding day, with the dress being a huge contributor to that. The key to finding the dress of your dreams and sticking to your budget is to be smart about how you shop. Luckily, you have several options. Some shops specialize in selling sample dresses. One of these shops is Glamour Closet in San Francisco, which specializes in high-end designer dresses (think Vera Wang). Dresses are typically samples or canceled orders. I highlight this store because I visited it, but many others exist in various cities. I visited Glamour Closet one weekday afternoon when the store was pretty much empty. Dresses in the shop are sorted by shape (A-line, ballgown, sheath, mermaid/trumpet) and then sorted further by embellishment. Because it’s a store of samples, most of the dresses are a bridal size 8, 10, and 12. 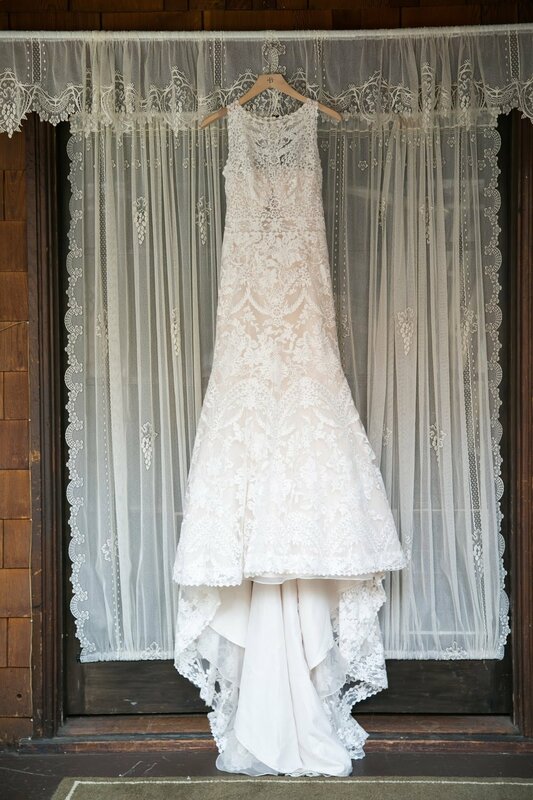 That’s one to two sizes smaller in street size (e.g., a bridal 8 is approximately a street size 4). I was lucky because they had just received a shipment of dresses in many sizes including smaller size and plus sizes, so the racks were stuffed. I tried on dresses by Carolina Herrera, Vera Way, Theia, and Nicole Miller. I saw dressed by Pronovias and Haley Paige as well. Dresses are heavily discounted but still run a few thousand dollars on average. That might be a lot for a frugal fashionista, but it’s a deal for a designer gown. Some of the gowns were heavenly! Because these gowns were mainly samples, not every dress was in great shape. Some were fantastic. I was the first to try on some of the samples and they looked pristine. Others had rips in the fabric or the seams or embellishments were coming apart. I loved the Theia dress I tried on but it had some rips and the lace was so soft that it was starting to pill. A few of the dresses I tried on. In front is a Claire Pettibone dress on sale for $2450 ($4575 retail). The second dress is by Carolina Herrera for $4100 ($9000+ retail). One of several beautiful Vera Wang dresses for sale. Sample sales are a great place to find discounted dresses. Be prepared to do some work both hunting for the right dress and then cleaning it up. This past July, BHLDN held a sample sale at their stores in the Bay Area. Dresses were priced at $100, $200, and $300, which is a real bargain from their retail prices. It pays to be familiar with the designers and styles you might see before you attend the sale. I browsed BHLDN’s current line of dresses on their website and did an online search for styles from past seasons. Once I had an idea of what I wanted, I called and asked if the style I liked would be available at the sale. The sales attendant also let me know that only bridal sizes 8 and 14 would be sold. They may have more sizes available at their other sample sales. From what I know about sample sales, it’s good to arrive early well before doors open so that you can be first to enter and have the best selection of dresses. Bring a friend or two to grab dresses for you and help you into and out of them. Wear clothing you can easily change into and out of. Once you find a dress you like, inspect it closely because sample dresses can be dirty, stained, or torn from being tried on multiple times. You may be able to sew a tear in the lining or spot treat a dress, but torn lace or rips on the top layer can be much harder to repair. It’s important to check the return policies of these stores too before you buy a dress in case the alterations and repairs you want cannot be done to it. Many other shops such as David’s Bridal and boutique stores hold sample sales regularly both in stores and online, particularly at the end of each season when making room for new dresses. Trunks shows are when representatives from designers come to a boutique to display and sell their collection. Sometimes a trunk show will include a greater variety of dresses than in the store or new dresses for the upcoming season. Many designers will offer discounts or customization when you purchase a dress at a trunk show. Follow your favorite designers and boutiques online or search them frequently on the internet to find out when and where trunk shows will be held. Trunk shows usually happen in the early months of the year (e.g., January and February). There are thousands of second-hand dresses for sale right now. This is a great way to get a designer or style you like at a discount, and you can often negotiate with the seller on price. Just be sure to read up on return policies. Many sites and sellers offer no returns. You can also find brick-and-mortar shops that specialize in selling second-hand wedding dresses. In Portland, Brides for a Cause sells wedding dresses for charity. Not only do you get a discounted wedding dress, you can feel good for helping others with your purchase. Second Summer Bride is another shop that sells used dresses located in Sacramento. A few of the wedding dresses available on PreOwned Wedding Dresses. Lots of mainstream mass retailers have entered the wedding dress business over the years. These companies offer low-priced wedding dress for the budget-minded bride Check out styles at shops like ASOS, ModCloth, For Love and Lemons, Reformation, and Missguided for reasonably priced wedding wear. One of my favorite brands is Adrianna Papell, which has a line of economical wedding gowns. Dresses are available in many sizes and ready for shipment. No need to wait several months to receive it. Given the price, they aren’t made of the finest silk and lace, but they are beautiful and may work for your budget and your wedding aesthetics. Another budget-friendly alternative is to wear a bridesmaid dress or evening gown as a wedding dress. If you’re open to a dress in a color besides white or ivory, you’ll have plenty more options. One of my friends wore a pink bridesmaid dress as her wedding dress. She looked so beautiful on her wedding day that I didn’t even notice she wasn’t wearing a traditional wedding dress. Custom-made dresses can be hit or miss. When looking at sites like Etsy or eBay, you’ll see that many custom-made dresses come from China or Hong Kong. Some of their reviews are glowing, while others are terrible. If you do decide to order a dress from overseas, be sure to read the seller’s reviews before ordering and keep in close contact with the seller throughout the process. More locally, businesses like Lace & Liberty in SF make customize dresses or separates for brides. Tops and skirts generally run a few hundred dollars each, but you don’t have to pay extra for alterations because it’s made to fit you. You may find other businesses in your area that can make custom pieces for you. I’ve always thought it was interesting how the groom can rent a tux but brides have to buy their dresses. That’s not true anymore. Nowadays, women can rent their dresses too. Here are some of the benefits of renting. First, you don’t have to pay full price for the dress you want. If you’ve been dying for a high-end designer dress, this may be your option to get it. And you don’t have to think about dry cleaning the dress, storing it, or trying to sell it yourself afterward. Some of the downsides include receiving a dress that someone else has worn. Who knows how much wear and tear it will already have? You have to keep the dress clean through the wedding and reception. You also cannot alter the dress. If you typically do not fit clothes off the rack, then a rented dress likely won’t for you. Being petite, I know this option would not work for me because I would need my dress hemmed. My friend, who is of more average height and size, has had good experiences renting clothing including dresses online. Consider borrowing a dress if the option is available. Your family member or friend may have a dress sitting in her closet and may not be planning on keeping it as a family heirloom. See if she would be willing to let you borrow the dress. Even if a dress doesn’t suit your style as is, you can modify it to make it more you. A plain dress can be embellished with a belt. You could add lace sleeves or a lace topper to a strapless dress to make it more embellished or modest. One often overlooked expense when it comes to buying a dress is the cost of alterations. Alterations can take up a large part of your budget, even making you go over budget. One wedding shop associate I spoke to said to budget between $450-850 for alterations. Many dresses can be altered for much less than that if the changes are not too difficult or detailed. It is important to keep the cost of alterations in mind though, especially when deciding to buy a used or sample dress that is not your size. I’ve been told that tailors can usually alter a dress up to two sizes down without changing the dress too much. Any more than that and they may have to make significant changes to your dress. Altering a dress to a completely different size can be pricey too. When buying a discounted dress, consider if the cost of alterations will make the dress cost essentially the same as buying the dress new. Using the tips above, I was to find my perfect dress on super sale. What did I choose? The BHLDN Adalynn. Originally selling for $1800, I got it on sale for $560 (plus tax). The frugal shopper in me is ecstatic! I can’t end this post without referencing Say Yes to the Dress. It’s my favorite reality TV show. I just love watching other brides pick out their wedding dresses. You can have a wonderful experience finding your dream dress too without visiting Kleinfeld or blowing your budget. Try the tips above and breathe a sigh of relief as you say yes to your own perfect dress. What did you do to save on the cost of a wedding dress? What other tips do you have for budget-minded brides?